Sprouts follows many of the best practices for increased pear category sales recommended by USA Pears, including displaying two green pear varieties at once. Additionally, they give shoppers choices by promoting multiple pear varieties, carry two sizes of top selling varieties, increase impulse purchases through in-store sampling, allocate plenty of the valuable front of store space to pear displays, and train personnel to improve category knowledge. “All of these tactics over the whole season add up to great category performance,” says Moffitt. Miller is honored to accept this award on behalf of the company. “It’s great to see Sprouts recognized for our ongoing efforts in driving a consumer knowledge and awareness of the category in which we attribute some of our success through the different usages that a pear can play in a enhancing a meal,” he says. This year, USA Pears also recognizes Costco Wholesale, Publix Super Markets, Defense Commissary Agency, Giant Eagle, Inc., Tops Friendly Markets and WalMart Stores as 2016 Pear Category Leaders. 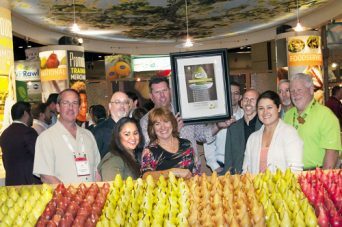 The Pear Retailer of the Year Award was established by Pear Bureau Northwest in 2011. Past honorees were Demoula’s Market Basket (2011), Meijer (2012), Ingles (2013), Publix Markets (2014) and Wegmans (2015). The Pear Bureau’s team of regional marketing managers selects the annual recipient based on sales performance, creativity, and best practices in pear merchandising, and overall excellence in supporting the pear category. Pear Bureau Northwest is a non-profit marketing organization established 85 years ago to promote the fresh USA Pears grown in Washington and Oregon, home to 84% of the US fresh pear crop. The Bureau represents nearly 1,600 growers and partners with grocery retailers throughout the world in an effort to increase overall success with the pear category. The organization provides marketing and merchandising expertise that is customized specifically for each retail organization, using its pear consumer research findings as well as individual store analysis using an in-house data system that measures pear category performance nationwide and third-party research to show retailers how they perform versus their competition. Retailers who are interested in partnering with Pear Bureau Northwest should contact them at profits@usapears.com or 1 (800) 547-4610, as well as visit the Trade.USAPears.org website.